Friday, September 18, at 8pm on MPB TV. Bathing beauty contests, schooners, early hotels, fantasy islands, pristine beaches, and a landmark lighthouse drew people to the Gulf coast. 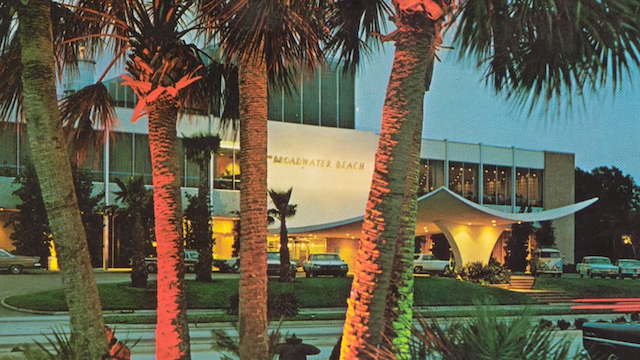 For many visitors, Biloxi and the Broadwater Beach Hotel are forever linked in their collective memories. Former hotel manager Jack Stanford describes owner Mrs. Joe Brown as a woman who “. . . knew what she wanted and how to get it.” Mrs. Brown’s renovations included the spa-like Lanai pool, and the luxurious Lanai rooms. During her tenure, Leon Kelner and his band played at the Broadwater’s Royal Terrace to rave reviews. Families held reunions and returned to the Broadwater year after year. New Orleans bride Leslie Landry enjoyed her first honeymoon at the hotel so much that she rebooked it for her honeymoon with husband number two. Long-time guest Dottie Ziegler’s favorite Broadwater event was the annual talent show to raise money for the Jerry Lewis Muscular Dystrophy telethon. Broadwater guests could also arrive by boat and dock their yachts at the Broadwater Marina which had its own lighthouse and restaurant. “I can remember as a child saying ‘I can’t wait to get there, I can’t wait to get there,’ and as you got closer and closer you could smell the sand and the beach and the water. It was just beautiful memories.”— Susan Gowland, New Orleans resident. In BILOXI MEMORIES and the BROADWATER BEACH HOTEL, visitors and residents share special moments. “Back in the seventies we’d go to the Fiesta Lounge in Biloxi.” New Orleanian Jerry Montalbano remembers the big bands and good times. Elaine Stevens recalls the line-up of stellar performers who appeared at her father’s Gus Stevens Restaurant and Nightclub, including the glamorous Jayne Mansfield and the events that led to her fatal accident. Bob Mahoney is proud to point out that his mother’s restaurant Mary Mahoney’s Old French House is featured in John Grisham’s novel Runaway Jury. Biloxi began as a small fishing village, and the warm waters of the Mississippi Sound still provide an abundance of seafood, as well as serve as a playground for swimming, sailing, and strolls along the beach. The documentary visits the George Ohr Museum which exhibits the creative works of the self-proclaimed “Mad Potter of Biloxi,” and explores the role of Keesler Air Force Base in the development of this coastal city. “If anyone was visiting this area, there was nothing like the Broadwater; in its heyday, it was absolutely the jewel of the coast.” —Leonie Johnston, Biloxi resident. Barbara Sillery is the producer, director, and writer for BILOXI MEMORIES and the BROADWATER BEACH HOTEL. Peggy Scot Laborde is the executive producer and narrator. The show is edited by Larry Roussarie. Dawn Smith is the associate producer.